Hi! My name is Marisa and I am one of Lauren’s assistants. I graduated with my degree in Public Relations and Marketing in 2015. I currently work full time as a Communications/Marketing Specialist in higher education (at my alma mater) and work for Elle & Company as the Content Marketing Manager part time. Like you, I used to avidly read the Elle & Company blog. I first stumbled across Elle & Company in the Fall of 2015 when I was researching SEO for Squarespace. 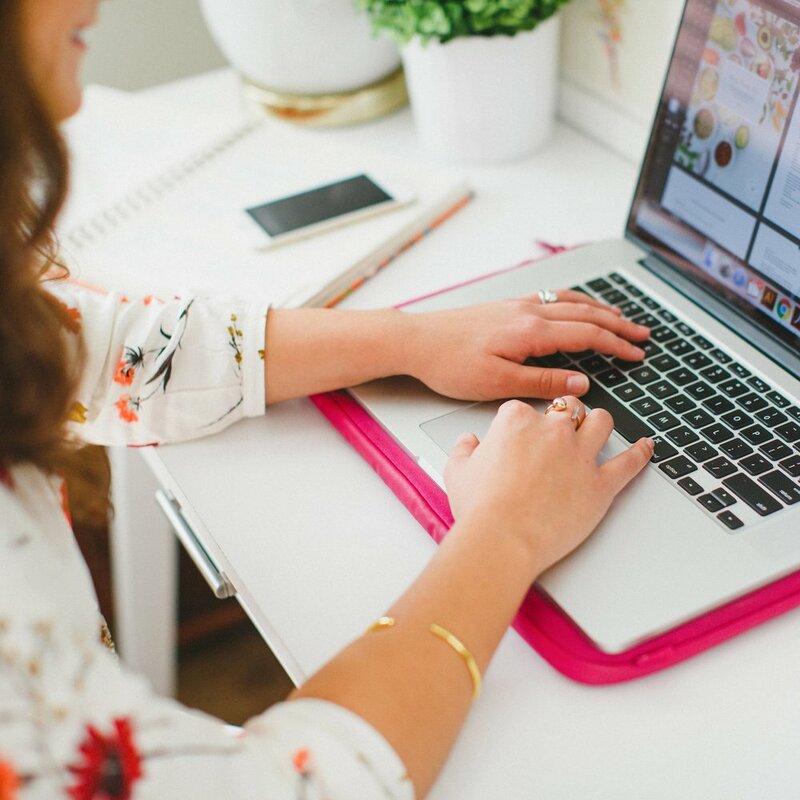 I came across The Truth About Squarespace SEO blog post and instantly become obsessed with reading all of Lauren’s blog posts and soaking in her colorful graphic design style all over her website. As I continued to devour blog posts, I came across 20 Business Tasks You Could Be Delegating and I thought to myself, “Hey! I could do/have done all of this stuff. In a moment of bravery, I reached out to Lauren, pitched myself, and asked her if she needed an assistant. At the time, she had just hired her first assistant, Jenny, and wasn’t looking to hire someone else so quickly. So I continued to read her blog posts and newsletters, I subscribed to the Library, and I tuned into Ellechats when I could. About a year went by and Lauren had just launched her Freelance Academy course for the first time and I wondered if she could use any extra help. So I emailed her again, thinking it would be a long shot. But to my surprise she emailed me back within an hour with the craziest story! She had been meaning to reach out to me for weeks to see if I might still be interested in the assistant position - she even had the email sitting in her drafts folder but had been too busy to push send. Before I started freelancing for Elle & Company, I was so curious as to how Lauren ran things behind the scenes and always wished she would share more “intimate business details”. Now that I’m on the other side, I constantly see requests from readers for this very thing. So today I’m taking you “behind the scenes” to talk to you about Elle & Company from my perspective. I work about 10 hours/week for Elle & Company. I log all my hours using a tool that I implemented when I first started working called Toggl. We used Toggl at the public relations, marketing, and design firm I interned at in college so I was very familiar with the platform and knew it would work for us. Every two weeks I pull my hours from Toggl into a PDF report and send it to our bookkeeper (and copy Lauren) to get paid. The bookkeeper does her thing and then I get an email that notifies me that my pay stub is ready. The next day, I get my paycheck deposited straight into my bank account. For the first year I was a contract worker but during this second year I was put on “payroll”. I’m super grateful for this because it means I get taxes taken out each time I get paid so I don’t have to worry about it during tax time. I’m so used to logging my hours in Toggl that it’s honestly second nature to me now. But if you, or your team, are just getting started with Toggl and struggle to remember to use it, I recommend downloading the Google Chrome extension. If you’ve been doing a single task for a while, a reminder will pop up that you might want to start tracking your time. It also allows you to start tracking your time right in the window you’re in, so you don’t have to open up a new tab and risk distracting yourself. I work 100% remotely (fun fact: I live in Alabama and Lauren and I have actually never met in person) so Lauren and I heavily rely on Asana and especially Slack to communicate, collaborate, and get work done. I implemented both Asana and Slack when I started working since they are tools I have used in the past for other contract work and at my full-time job. Slack is truly a game changer for us when it comes to communicating quickly. I constantly message Lauren to ask questions, update her on projects I’m working, and just to catch up. This is definitely our primary method of communication. We use Asana mostly to keep up with our Content Queue, but we use it for other projects as well. Both Lauren and I are very type A, so it’s easy for us to agree on how we like to keep Asana organized and maintained. One of the biggest things that helped us with Asana organization was establishing and setting up workflows. Someone in the Facebook group asked what processes and checklists we use and the answer is the workflows we set up in Asana serve as our checklists. For example, let’s say we’re working on a blog post. The tasks involved in getting a blog post up include: outline, write, design graphic, edit, and set up and schedule. Of these five tasks, Lauren and I already know exactly who is going to do each task since we’ve been on a system for so long. I always start by researching and outlining the blog post. You might be surprised to learn that I write about 80% of the Elle & Company blog posts. However, if I’m not familiar enough with the topic I’ll ask Lauren to step in. Lauren always designs the graphic and adds it to the Asana task. Lauren will then read through the blog post and edit so I get a second pair of eyes on it. Finally, I’ll set up and schedule the post. We draft all our blog posts in Google Drive so transferring all the content over to Squarespace to set up the blog post can be tedious, but I tend to put on some music and knock it out and sometimes find it quite therapeutic. We have a system or workflow like this for all the tasks we perform - blog posts, newsletters, Ellechats, etc. It definitely took awhile for us to find this rhythm, but now that we’re in it, it makes collaborating on work so much easier. When it comes to other tasks like emails, social media, courses, client work, etc. we also have an unspoken system for those projects as well. I handle emails and social media and Lauren handles courses and client work. We don’t tend to talk about these tasks too often since we already know our “lanes” and tend to stay in them. However, there are exceptions. For example, in the recent Zero to Squarespace course we launched, Lauren took care of creating all the content for the modules, but I mined the pre-course feedback survey and categorized topics to help us decide what content Lauren should focus on in the course. I was also responsible for the bonus guides on copywriting, CSS, and Squarespace’s new Email Campaigns feature. One of the things I love most about working for Elle & Company is how open to suggestions Lauren is when it comes to her business. Because I have a background in public relations, communications, marketing, and education, Lauren gives me so many opportunities to brainstorm with her and her husband Jake about Elle & Company products, courses, and overall business direction. I love that I’m given the opportunity to be a part of these conversations because even though I only work for Elle & Company part time, I’m super passionate about the work that I do and sometimes feel like it’s my own little business too. When I first started working for Lauren I didn’t get to brainstorm and be as involved in decisions as I am now, but over time I was able to build and gain trust which has helped Lauren and I’s working relationship reach the point it is now. Some of the ways I did that is by checking in regularly even though I’m a remote worker. About once a week I will send Lauren a message on Slack with the sole purpose of seeing how I can support her that week and asking her if she needs my help on any projects or tasks that might not necessarily fall in line with the work I typically do. I also regularly keep up with others in the industry to see what they are posting about to help inform what Elle & Company does. I follow other creative entrepreneurs on Instagram, read their blog posts, and listen to their podcasts. My full time job has also afforded me the opportunity to professionally develop in ways that mutually benefit my full time work and my part time work. I’ve been able to participate in Marie Forleo’s B School and The Copy Cure, Paper & Oat’s InDesign Field Guide, and more. Since I work in marketing for both my full time and part time job, I am constantly keeping up with industry best practices and don’t shy away from making Lauren aware of them as we brainstorm certain initiatives. One of the most commonly asked questions regarding Lauren and her assistants is how we got “in the flow”. In the beginning, it can be difficult to recognize what work can be shared and it takes a lot of trial and error. If I could recommend one strategy it would be to take the first several months to explore what special value each assistant or assistants brings to the table. For example, when I first started working for Elle & Company I was hired on as an assistant. Jenny, Lauren’s first assistant, was also working as an assistant. Although we typically worked on our own unique tasks, about a year into having two assistants, Lauren created two separate titles for us and gave us specific job descriptions. Jenny was in charge of emails, client work administration, and analytics. I become responsible for content, project management, and social media. These new job descriptions gave us a way to categorize ourselves and I think it made it easier on Lauren to decide what kind of work she would assign to who. Another way I was able to so easily “get in the flow” had a great deal to do with how much access Lauren gave me to Elle & Company. This may not work for everyone, but I’m able to log in to almost every account, tool, resource, etc. that Lauren uses for Elle & Company. This access has allowed me to get up to speed and stay up to speed with everything Lauren and Elle & Company has going on - and we have a lot going on! What questions do you still have about Elle & Company? I’m happy to answer them below!